We have helped dozens of startups and small grocery stores build their online grocery delivery businesses over the past four years. In doing so, we have found that many entrepreneurs have similar questions on how to launch this type of service. 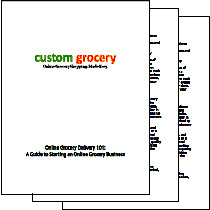 The answers to these questions can be found in our startup guide: Grocery Delivery 101. Please contact us to receive this free guide. Gopher Grocery wanted to legitimize its online grocery delivery business in Minnesota. Custom Grocery worked closely with the owner to provide this startup with the software necessary to reach the next level in online grocery delivery. After only six months, Gopher Grocery is now the 2nd largest online grocery store in Minnesota. Visit their website to see what Custom Grocery could do for you.